It seems like I haven't been alone in struggling to keep my little ones busy as this week in particular as half term has struck, I've saw no end of grumbles from struggling parents with stir crazy little ones, looking for ideas on what to do. Rattan Direct has developed a little survey because they're trying to figure out exactly the same - how do you keep those little ones on their toes? So here are my top tips I've found for keeping the kids busy. Messy play! Yes that's right - get messy. There are so many activities for babies to do that are completely safe if you are worried about them trying to eat the items. A classic is, cooked pasta (spaghetti works wonders) dyed with food colouring and let them play till their hearts content. Just trying to pick it up is entertaining enough. If you're wondering where on earth you can do it to limit the mess - grab that baby bath that you used twice and turn it into a messy play zone. Sensory Hoop - Get a good old fashioned hula hoop, and wrap as many different sensory objects you can think of around different sections of it. Think furry felt, tin foil, glue glitter on. Pop baby either in the middle of the hoop or outside, and rotate it when they're getting a little bored. It's great for their tummy time and strengthening neck muscles. Pouring activities. I don't think there was anything Noah loved to do more as a young toddler than pour. He would do it for as long as I'd let him. Get creative though, water in a bath is only fun for so long. Try dried pasta with pots and pans as pouring utensils, or if you're after some peace and quite go for pom poms with paper cups. Car washing. If the weather isn't good enough to get washing outdoors (who says we can't make those little ones work) then grab a washing up bowl, some suddy water and their toy cars or animals. Be prepared for water EVERYWHERE, so perhaps maybe one for a wipe-able floor. Jelly cube towers. Ok this might be one for the adults too. I mean I definitely didn't compete with John on this - it's SO much fun. If you haven't got jelly cubes, try oxo or anything similar. It's fun and relatively mess free plus it beats boring old blocks and gets their fine motor skills on the go. Threading pasta. Grab some spaghetti and some penne pasta, and watch your little one again giving it their all with their fine motors and threading away. If spaghetti keeps snapping feel free to swap it up for some string until they're a bit more steady with their hands. Who needs beads when you've got store cupboard essentials? 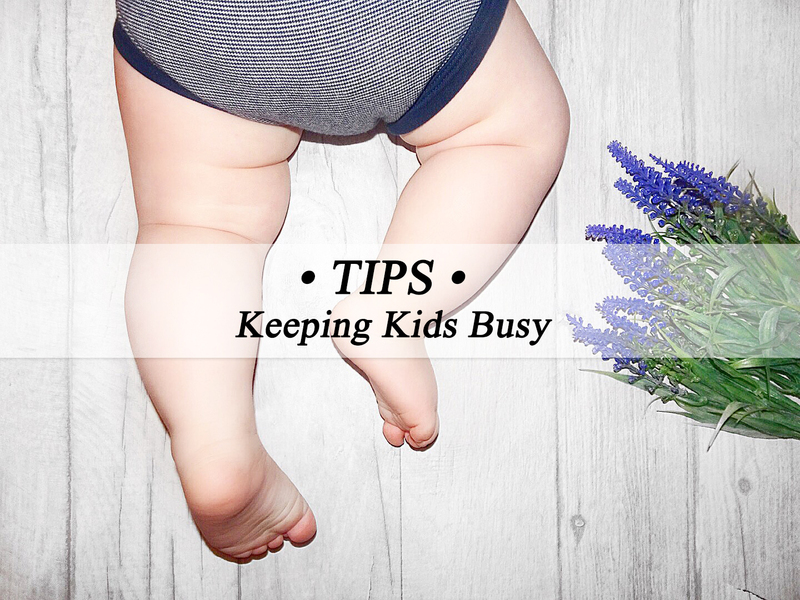 So they are my top tips for keeping little ones busy, with equipment you most likely have in your home. Do you have any fail safe activities that buys you that little bit of extra time? I love the idea of a sensory hoop! I've just ordered some scarfs to stuff into a wipes box so when Eleanor is a bit older she can play with that. I've just started buying "sensory" toys for Rory! Basically spiky balls from Poundland 😂 I love the idea of a sensory hoop! I would do the survey but it seems to be aimed at older children! This post is lovely, I love the ideas. I mostly love the chubby legs in the picture. So cute!! !